328 people spent their first night camped out at Los Angeles City Hall last night. At the General Assembly on Saturday evening there was a long discussion, that got quite heated at times, about whether to camp out on the grass or to move to the sidewalk as requested, under threat of arrest by the police. In the end almost everyone moved to the sidewalk last night but they are back in the City Hall park today. In the end, the threatened police crackdown never materialized. As it turned out, the LAPD had bigger fish to fry. The entire department was put on a citywide tactical alert Saturday night but that had nothing to do with Occupy Los Angeles. Two undercover narcotics cops got shot in a drug deal gone bad in Korea Town. As of this afternoon, the suspects were still at large so the police presence at city hall has been relatively light. Actually so far, the LAPD has been very accommodating to the march. Although they had no permit for the march Saturday and they marched on the sidewalk, the police stopped traffic at every intersection so that the eight minute procession could be out of everyone's way as much as possible. They could have made them bunch up at every red light and written tickets for anyone that missed the cue. A single police car was posted on the street across from the protest all day Sunday but apart from the fact that it happened to be parked in front of the LAPD headquarters, which is also across the street from the city hall, there wasn't much of a police presence. No cops were even seen to be patrolling the grounds surrounding city hall. Those familiar with the LAPD's response to mass protests in the past knows that this has not always been the case. Sunday was a most pleasant day at Los Angeles City Hall. Sunny and in the mid 70's with a slight breeze. There was coffee in the morning and various kinds of food all day. Either in the morning or sometimes doing the night, everyone who had pitched tents, moved then from the sidewalk back to the grassy part. 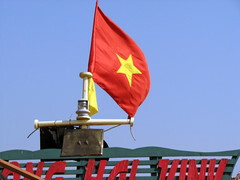 There are many committees, too many to name in a short article, and there were meetings all day preparing for the General Assembly in the evening. There was food preparation and distribution, others distributed water, making sure dehydration wasn't a problem in the sun, although most people stayed under the ample shade of the trees there. In the morning someone gave CPR training, complete with dummies and certification. There were generators brought in for power Sunday and the media team kept the live streaming webcam going all day. Internet access was also better today. The porta potties were the best ever seen at a protest, not the usual plastic blue jobs that reek of chemicals and what they are trying to disguise. These were the type used on film sets with light, air, soap, regular toilets, wash basins and art work on the walls. One protester was heard to remark "We may sleep like we're on skidrow but we pee like we're in Beverly Hills." An information and welcome tent was setup for the constant stream of newcomers that came to visit or stay. A lost and found was established and a place around the block made its restrooms available to the protesters 24/7. People came from as far way as Ojia and Orange County. In the space of 48 hours a new Los Angeles community was taking shape in the park surrounding city hall. 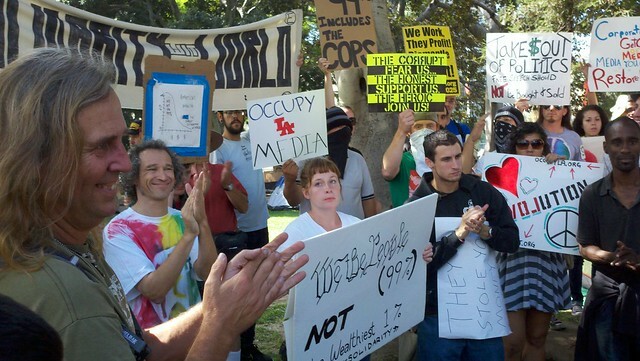 Unlike Occupy Wall St. or most of the occupy everywhere movements, the one in Los Angeles got major TV coverage on the first day, KABC came out late Sunday night and interviewed some of the people camping out. They ran those with the morning news cycle. This and other reports assured them of many new vistors. Once again the Los Angeles movement showed its superb sense of timing. The major US media had boycotted Occupy Wall St. for two weeks already and was nearing the limit of that tactic. The bust of 700 on the Brooklyn bridge Saturday gave them the kind of story they could run with but that also meant they could not avoid covering the local protest also. 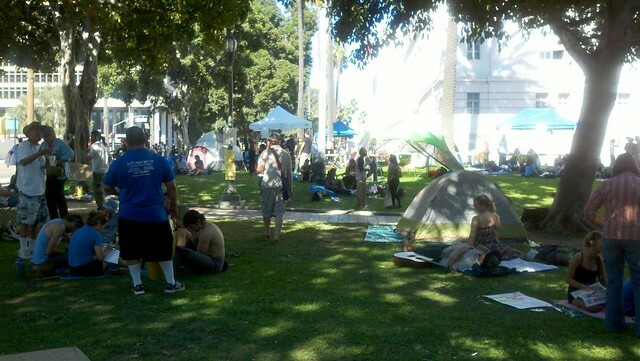 These events cause this writer to tweet "#OccupyLA 1st day & night, no arrests. Did #OccupyWallSt go a bridge too far?" In the morning a group from OccupyLA noticed a parade or march nearby and went to investigate. They found it was a group doing some good works but sponsored by Bank of Amerca. When this procession arrive at its rally point, the OccupyLA group started leading anti BoA chants and most of the neighborhood people BoA was sponsoring joined in on. That was not a schedule action. Occupy Metro, on the other hand, was a scheduled action in which a lot of protesters rode the metro from city hall and back, all the while agitating for OccupyLA and Occupy Wall St. The transit cops also seemed to be sympathetic and helpful. Many of the protesters told them they were part of the 99% and should be in the park with them. Others, however didn't agree. They saw all police, even all transit cops as simply agents of the capitalist state without a dual character, i.e., without a human side, without an identity as workers. They had sharp difference with those that thanked the transit cops for their consideration. They also objected to the security team's strong suggests the night before that all those staying the night move to the sidewalk to avoid the arrests the LAPD had promised for those insisting on sleeping on the grass. This is a relatively small group of less than a hundred young people in their twenties, many with a preference for dark clothes and faces hidden behind bandannas that see the need for a conflict with the police. They also insist upon their individual right to take whatever actions they think appropriate, either legal or illegal, regardless of whether it is sanctioned by the larger group. They have been allied by some members of a much more sophisticated left group that have not been a part of the creation of OccupyLA but now want "in" to what is probably the most important movement in the past decades in Los Angeles. They see a way to build a following by appealing the the "militancy" of these youth. All day the coalition met, first one place, then another. First in the "facilitation committee", then as the self-created "police abuse or brutality committee" to discuss their grievances with the police, the security committee and the larger group as a whole. They accused the security committee of acting like police and taking orders from the police. They were of a mind to disband the security committee and make security the task of everyone. Although they generally expressed a freedom to ignore group decisions even if arrived at democratically, they felt that the group process had been very undemocratic and had many suggests on how to fix that, such as having breakout sessions before votes on most questions. When one veteran activist, who was a named plaintiff in the 1984 ACLU/LAPD police spying case and spent his first months in jail for anti-war protests more than four decades ago, joined one of these discussions, he was told by a member of the "left" group that this wasn't a discussion for those that loved the police. This same activist was told the by his "stack keeper" that the facilitators "probably wouldn't let him speak" the second time he asked to be listed to comment at the evening General Assembly even though his first comments to the GA were met with strong applause. There were many other problems with the way this meeting was conducted. So Sunday with the bright Los Angeles sun beaming down on them, some dark clouds also formed over occupy LA. Some of those that had provided the most leadership to this "leaderless" group and done the most in the last week to make this thing happen weren't at or active in this meeting, possibly because of other obligations or perhaps shear exhaustion. Others, with an agenda that may not even be clear to themselves have stepped to the fore and are attempting to utilized the leaderless nature of this movement to enforce there own. They would like to see a confrontation with the police even though the police have been on their best behavior and they hold in their hands the power to destroy Occupy Los Angeles.